JEC Twin-screw pumps are driven by an external helical timing gear, which has a very hygienic structure for non-contact metal. The structure was satisfied with EHEDG, 3-A standard. 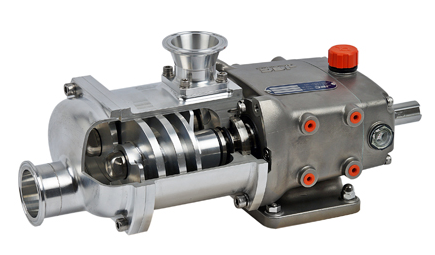 "2-IN-1 PUMP": Delivering the benefits of both positive displacement pumps and centrifugal pumps. High-speed range up to 3,000 RPM, allow either products or cleaning solutions to be pumped with only one pump. VISCOSITY: Capable to transfer products of low and high viscosity From 1 to 1,000,000 CP. GENTLE: Carefully can handle fluids containing only soft particles like whole grapes and others products, up to 1 1/4"size. SELF-PRIMING: Are capable to lift from a depth up to 22 feet. REVERSIBLE OPERATION: The pump can work in both directions. MAINTENANCE: Easily dis-assembled and clean. VERSATILITY: The KST/KSFT pumps, thanks to the hopper and auger, are suitable for pumping high viscosity products, doughs, pastes and liquids with suspended particles. JEPS, self-priming pumps are specialized for air and gas contained products which cannot be pumped by general centrifugal pumps. 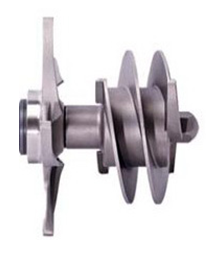 Special designed air screw generates self-priming effect can optimize pump operation. The air-screw rotation forces the mixture of liquid and air through the chamber which are then pumped out without cavitation problem. 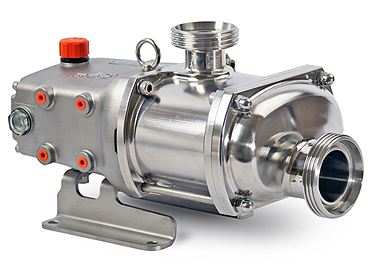 Can I use the same CIP return pump to empty my product tank? Yes, the hygienic design means the pump may also be used to handle the product.